Caywood farm tours are truly a family affair. Although the presentations and demonstrations are primarily delivered by two of us (Nancy Caywood-Robertson and Al Robertson), you might see any number of family members—on any given day—contributing to the tour. To learn more about our family, please visit the About Us page. Are you Curious about Agriculture in Arizona? Please join us for a farm tour that is informational, entertaining and interactive. When you leave our farm, you will feel like you had a full day of fun and learning! As part of the presentation—and in addition to learning about cotton—you will be informed about: farmers as stewards of the land; the importance of water conservation; food safety; and challenges facing family farm owners. We offer tours for both schools and adults. 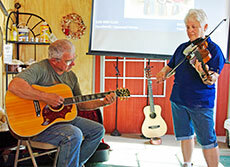 We start the tours with live music (Nancy plays fiddle, while Al plays guitar and autoharp). We will make you feel at home on our farm! You will also enjoy a fun-filled hay ride, pulled by one of our antique tractors. The hay ride takes you for a tour around our property. Our farm tour is hands-on: you will pick lint from cottonseeds, compare the lengths of Pima and Upland cotton, tour the farm on a hay wagon, and see farm equipment up close (some of which is demonstrated). You will also have the opportunity to pick cotton for yourself and take it home with you. Caywood Farm is a fifth generation farm near Casa Grande, Arizona (find our farm). 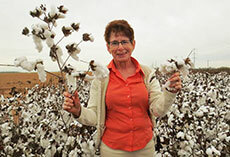 We are a working farm; we grow both alfalfa and cotton. Watch for our 2018-2019 Farm Tour Schedule!